HU and Goshen finished up a four-game series with two wins apiece as the Foresters set their sights on the CL tournament. On Apr. 22 and Apr. 23, the baseball team hosted Goshen College in a four-game series that ended up knotted at 2-2. Friday evening started off well for the Foresters. They logged a 7-2 win over the Maple Leafs after battling back from a 2-1 deficit, with their only run in the first five innings coming from a hit by Dalton Combs. In the fifth inning, Dylan Henricks hit in the tying run with a single, and then DJ Moore got on base while driving in another run. Andy Roser hit a sacrifice fly that pushed in another runner to give HU the 4-2 lead. The first three HU batters of the sixth inning drew walks, and Moore hit the ball to right-center to drive in their last three runs and give the Foresters a comfortable lead. Brock Gower pitched to the Maple Leafs, giving up five hits and two runs while striking out six. In the second game of Friday night, Combs registered an RBI to give HU a 1-0 lead, but the Foresters could not produce any more runs and lost the game 3-1. Tarrin Beachy pitched 5.1 innings for the Foresters, giving up five hits and three runs, while walking six batters and striking out five. Goshen came out firing Saturday evening as they blanked the Foresters 14-0 in the first game. HU played six different pitchers, but they couldn’t stop the Maple Leafs and their 18 hits. 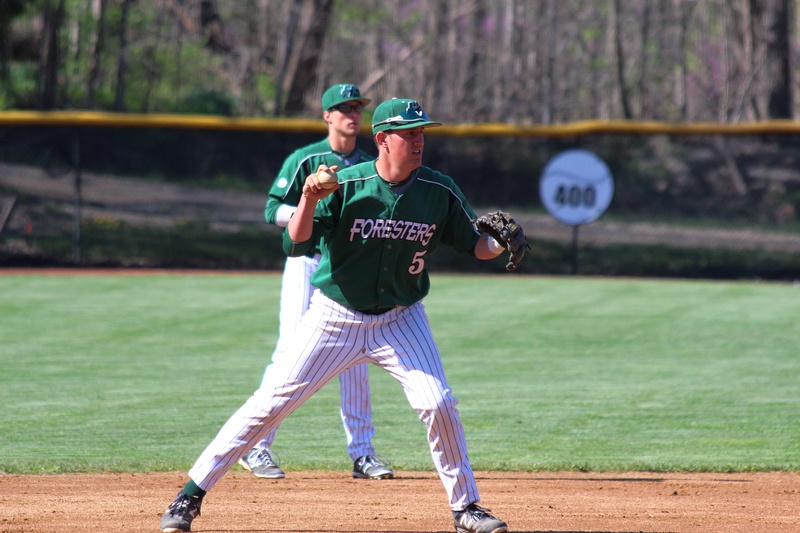 The Foresters bounced back from the defeat and started off the second game strong behind a home run from Combs and two hits by Mike Crowley and Gower. HU finished with 13 hits to Goshen’s ten. Gower was a perfect 3-for-3 at the plate and drove in a run, while Crowley finished with two hits and three RBIs. In addition to his dinger, Henricks tallied a double, scored twice and registered an RBI. Beauchamp added two hits and an RBI as four Foresters recorded multiple hits. Starting pitcher Tanner Wyse earned the win in the circle. In 6 and two-thirds innings, Wyse gave up 10 hits and four runs while striking out seven batters. While the Foresters acknowledge that they had high expectations coming into this season, from here on out they are determined to make the season as good as it can possibly be. Coach Mike Frame wants to see his players “relax and play,” and still has his sights set on winning the conference tournament. He encourages his players to get better at something every time they step on the field. “Our focus for the remainder of the regular season is to get better each day in order to be playing our best baseball going into the tournament,” Henricks said.